LECTURE ON AMERICA – On Tuesday evening, the Hon. W. Broderick endeavoured to instruct and amuse the inhabitants of Swanbourne by an interesting lecture on America, at the national Schoolroom, which was filled. The Lecturer, being introduced by the Rev. J. Niven, proceeded to illustrate the position of the belligerent armies on the map, and said he thought the safest way to form a correct opinion on the present war was from the writings of Englishmen who had seen it, and as he was personally acquainted with Lieut.-Col. Fremantle, who had spent more than three months on the spot, he should quote largely from a book the Colonel had written on the subject. The lecturer then described at some length Lieut.-Col. Fremantle’s experiences and travels amongst the Confederate army, retaining the interest of his audience by several humorous extracts, and, by way of interval, the Misses Fremantle played and sang the Confederate national air “My Maryland”, the audience taking up the chorus. After finishing his subject, the lecturer wished to point out a lesson that might be learnt from what he had said: – America is not at the present time a desirable place to emigrate to, and although he did not mean to ignore the fact that many poor men had gone out and done well there, many were the instances of a contrary result. Although wages were high, the pay was paper money, which was nearly valueless and the price of provisions was proportionate to the wages, and he would recommend a careful consideration of the disadvantages as well as advantages to and contemplating emigration. The Rev. J. Niven proposed a vote of thanks to the Hon. W. Broderick for his lecture, which was heartily responded to, and the meeting ended with the singing of the National Anthem. 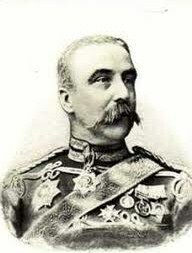 Lieutenant Colonel Arthur Fremantle was a cousin of the Swanbourne Fremantles. This lecture in Swanbourne was based on his published diary “Three months in the Southern States”, in which he had travelled with the confederate army. This account is still valued today as a useful diary account of the period by scholars of the American Civil War. L.-Col Arthur Fremantle was Assistant Military Secretary of Gibraltar under Governor William Codrington when in January 1862, the Confederate commerce raider CSS Sumter arrived in port. The ship’s commander sought to have his ship repaired and refitted, so early in 1862, the young British officer met the Confederate captain in Gibraltar, and was fascinated by Semmes’ stories of blockade running and combat at sea. Fremantle was inspired to seek leave to travel to the Confederacy. 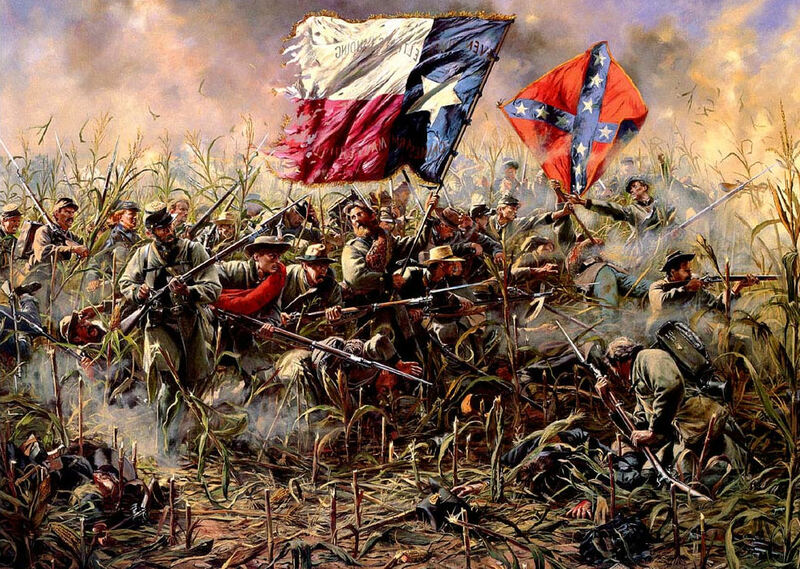 At the outbreak of the American war, in common with many of my countrymen, I felt very indifferent as to which side might win; but if I had any bias, my sympathies were rather in favour of the North, on account of the dislike which an Englishman naturally feels at the idea of slavery. But soon a sentiment of great admiration for the gallantry and determination of the Southerners, together with the unhappy contrast afforded by the foolish bullying conduct of the Northerners, caused a complete revulsion in my feelings, and I was unable to repress a strong wish to go to America and see something of this wonderful struggle. Having successfully accomplished my design, I returned to England, and found amongst all my friends an extreme desire to know the truth of what was going on in the South; for, in consequence of the blockade, the truth can with difficulty be arrived at, as intelligence coming mainly through Northern sources is not believed; and, in fact, nowhere is the ignorance of what is passing in the South more profound than it is in the Northern States. In consequence of the desire often expressed, I now publish the Diary which I endeavoured, as well as I could, to keep up day by day during my travels throughout the Confederate States. L.-Col. Arthur Fremantle travelled through the southern states for three months observing the war and the southern people. I have not attempted to conceal any of the peculiarities or defects of the Southern people. 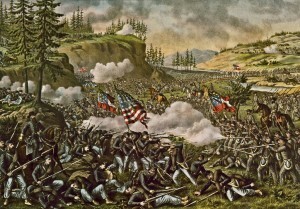 Many persons will doubtless highly disapprove of some of their customs and habits in the wilder portion of the country; but I think no generous man, whatever may be his political opinions, can do otherwise than admire the courage, energy, and patriotism of the whole population, and the skill of its leaders, in this struggle against great odds. I am also of opinion that many will agree with me in thinking that a people in which all ranks and both sexes display a unanimity and a heroism which can never have been surpassed in the history of the world, is destined sooner or later, to become a great and independent nation. 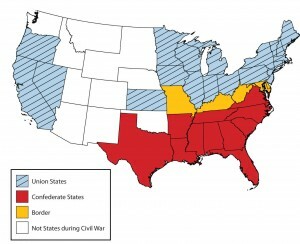 American Civil War (1861-1865) map. Texan troops depicted in this painting of the American Civil War. CLICK to read Lieut. Col. Fremantle’s full diary account. Alfred T Willett from North Bucks (and with Swanbourne ancestry) enlisted in the Ohio Infantry and fought for the North in the American Civil War. Reproduced by kind permission of Julia Willett Carmichael. 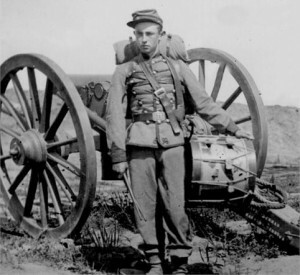 An additional link to the American Civil War is provided by Alfred Willett (who emigrated as a child with his parents from North Bucks), serving right through the American Civil war in the Ohio Infantry. Alfred is descended from the Williatt family of the Horwoods and the Adams and Deverell families of Swanbourne. Further analysis of the subsequent family tree reveals that this branch of the Willett (Williat) family is also descended from Agnes Adams who was the sister of John and Thomas Adams (Joint Lords of the Manor early in the 17th Century). Their descendants live in the USA today. Within this tree, Alfred Willett, born in 1842 in Shenley, Bucks (and who emigrated as a child with his parents from North Bucks) served right through the American Civil war in the Ohio Infantry. After volunteering for service in October, 1842, to help put down the “wicked rebellion” Alfred’s 25 letters to his sweetheart were kept, along with an 1864 diary. 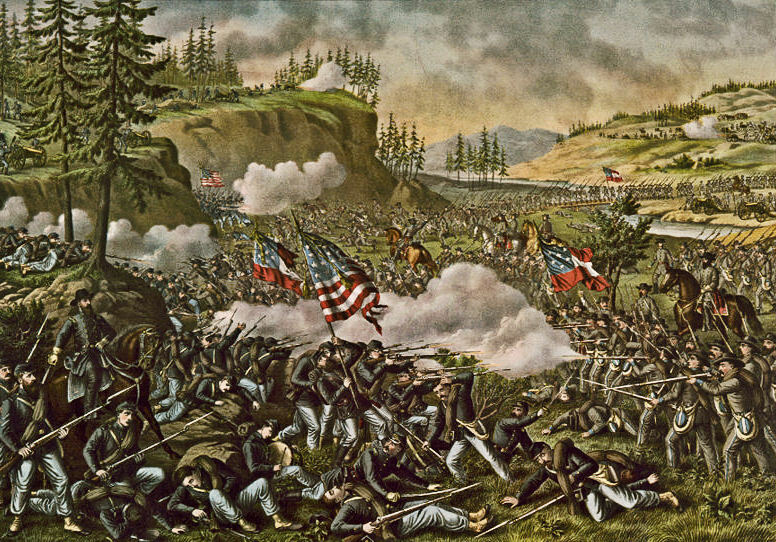 In these letters Alfred tells of fighting in the battles of Chickmauga, Kennesaw Mountain and in Sherman’s March to the Sea, and reported that (after fighting in a cornfield) he woke the morning after to find “the dead lay round where we slep”. 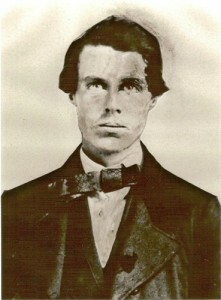 SOURCES: A Union Soldier Return to the South By Charles Willett; Three Months in the Southern States: April, June, 1863 by Sir Arthur J. L. Fremantle.